Its time to give a smooth and cozy touch to a home and this carpet is handwoven for the same. 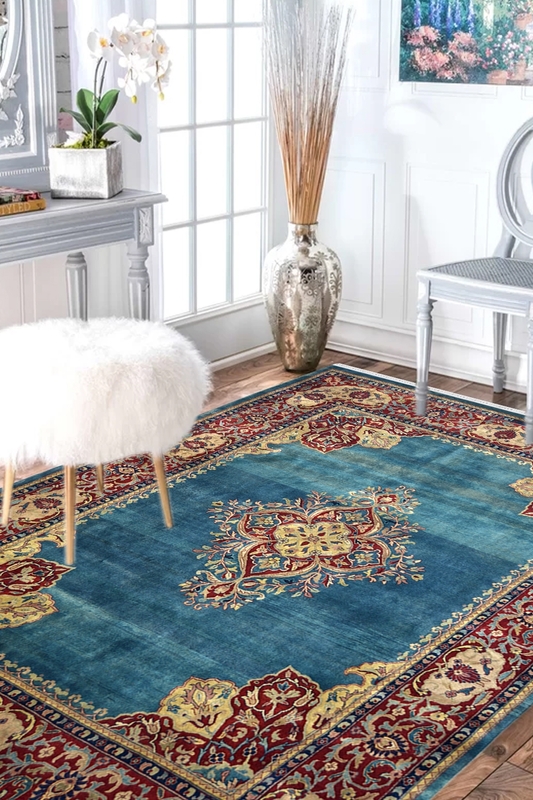 Buy this "One of a kind" hand-knotted wool area rug from here and provide a new look to your living space. This is Ideal for a bedroom, living room and dining room as well. Let’s add the additional warmth and charm to your room with this Turquoise medallion Classic carpet. It has a Kashan medallion design which is a very traditional classification of Persian carpet and originated from Persia. It has the much-defined pattern and really difficult to weave. It has taken about 8-9 months to weave. The primary colors are Turquoise, yellow and red. The ground is in turquoise color and the design pattern in gold color. This is really very suitable when you place it with gold color furniture.